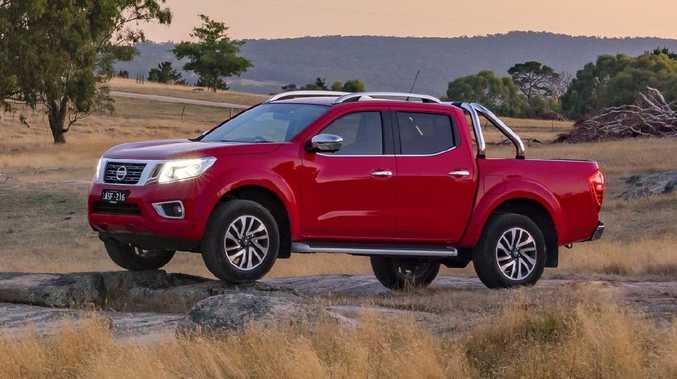 IN OUR ute-saturated market, Nissan's Navara has sold more than 12,000 examples so far this year, placing it midfield behind the Toyota HiLux, Ford Ranger, Mitsubishi Triton and Holden Colorado. The Navara is the only one with more car-like coil spring rear suspension. Those rivals have leaf springs. Does the flagship ST-X 4WD dual-cab pass the family duties and lifestyle pick-up test? 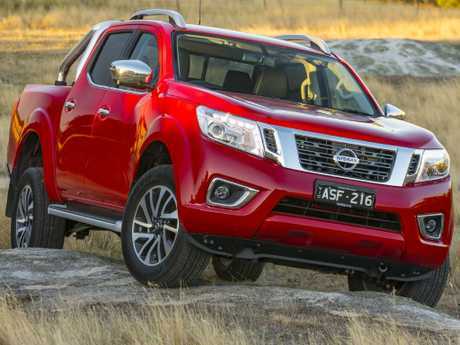 IAIN: Of all the double cab utes out there, the Navara's one of the best looking. It blends sharp style with toughness well. JULES: It looks like a proper truck. Lots of chrome so I'm expecting it's expensive? IAIN: This is the range-topping dual-cab ST-X auto, at about $60,000 on the road, although ABN holders will get a better deal. JULES: What does that buy? IAIN: Outside are 18-inch alloys, chrome door handles and mirrors, side steps, protective tub liner, roof rails and alloy sports bar. JULES: And this is what people are buying? IAIN: Oh yes. Some 90 per cent of Navara sales are dual-cab pick-ups, 80 per cent are 4WDs and two-thirds are the top two grades. JULES: Lifestyle over true work utes, then. Australia's gone mad for them. IAIN: The interior's a bit plain. Well laid out but lacking real panache for a range-topper. JULES: I expected leather seats in the flagship. IAIN: Leather seats are a reasonable $1500 option, with power adjustment and heating. 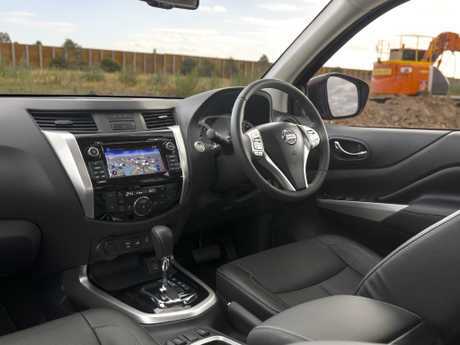 JULES: The cloth seats in ours feel really durable and I reckon they make more sense if taking the Navara camping or off-roading. IAIN: Fair point. Infotainment-wise the seven-inch screen has satnav but sadly no Apple CarPlay or Android Auto. JULES: Really frustrating, as the rest of the cabin has a more SUV than work truck feel: smart key, push-button start, dual-zone climate control and carpet floor mats. IAIN: Still lots of old fashioned hard plastics and quite cheap-feeling switches though, alongside classier piano black trim. JULES: It feels work-ready. Storage for phones, drinks and paperwork is excellent. Its dash-top storage tray should be obvious for utes but many don't have them. IAIN: I tested this "NP300" Navara at launch in 2015. Its steering was vague but its coil-sprung ride was good. JULES: Why don't other utes use coil springs? IAIN: A few reasons. 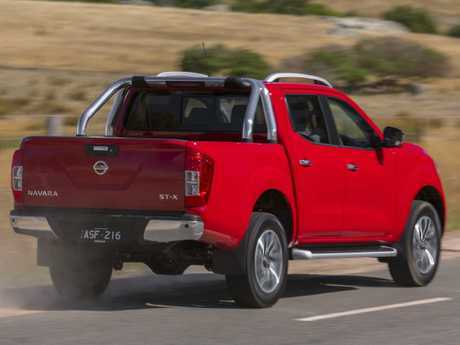 As Nissan found, the more on-road friendly Navara struggled with ride quality when it had decent load in the tray. JULES: What have they done about it? IAIN: Modifications in 2016, then again early this year to bring a stiffer dual-rate rear spring set-up and more responsive steering. JULES: It's pretty comfy on the highway but feels bouncy once you hit road imperfections. IAIN: Yep, that's why I tested it with some book boxes, heavy tool box and garage junk in the tub. It settled things a bit but even then it's no match for a proper SUV or my benchmark ute, the VW Amarok. JULES: The engine sounds very diesely on start-up but purrs nicely at speed and has decent poke. IAIN: The seven-speed auto helps with the feeling of refinement, too; the engine and gearbox combination is a real strong point. JULES: You need a soft or hard cover over the tub to make it practical. IAIN: True. Groceries need to be in boxes rather than bags to stop fruit and vegetables pinballing around in the back. JULES: Shopping bags go in the passenger footwells. It's a lot easier than lowering the heavy tailgate. And parking? Not easy in these big utes but the 360-degree camera is brilliant. IAIN: I've done some challenging off-roading in the Navara and it walks over most terrain effortlessly. JULES: If you're paying this much you'll want serious exploration potential. IAIN: The ST-X has the goods - low-range, electronic rear diff lock and hill descent control. It's armed for steep, loose, boggy or sandy terrain. JULES: Will owners use it? IAIN: Some will and also might exploit the 3500kg towing capacity. For the ST-X grade, the payload is 931kg, so it's not a true one-tonner. Most people will pay the ST-X price for the image and knowing what they can potentially do with it off-road. IAIN: The kids loved it ... as they do every truck. JULES: I've a theory. Men aren't growing up properly any more, so you buy a ute to live out your "I'm a truck driver" fantasy from childhood. IAIN: Less psychoanalysis, please. 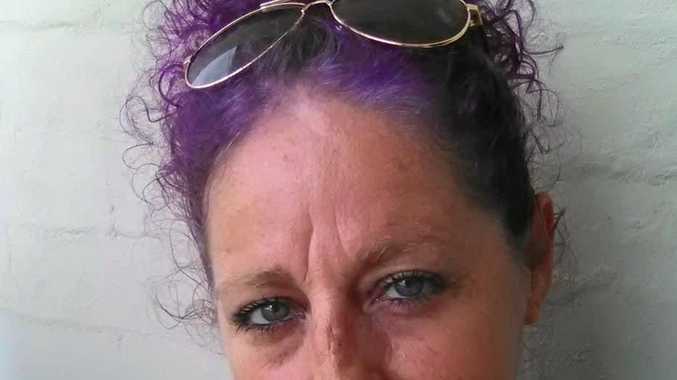 Can I get a CB radio and trucker's hat for Christmas? JULES: Positively, it has Isofix mounts for child seats, rear air vents and seven airbags. IAIN: We returned under 8L/100km fuel economy, which is impressive. JULES: There's also a rear power-sliding window operated by a dash switch. The kids loved this, plus it helps you reach things in the tub or poke fishing rods through. 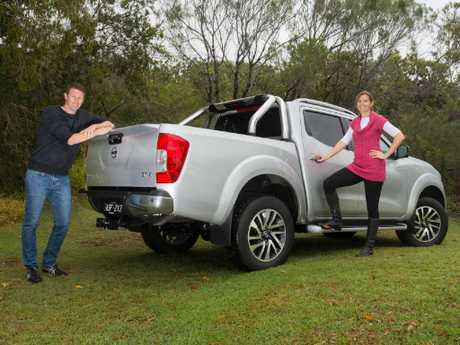 IAIN: The Navara's a safe ute choice with reasonable on-road manners and plenty of off-road ability in the ST-X. Shame many owners will never explore this. 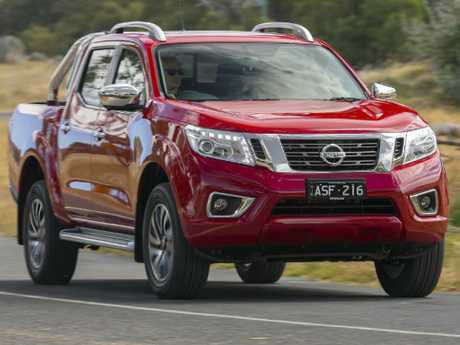 JULES: I still can't abide a 4WD ute as a family car when an SUV driving all four wheels is comfier, more practical and often cheaper than these top grades. If it's used primarily as a work truck it makes sense but I'll take an SUV if it's the main family vehicle.